Laurina Uribe brings a strong, positive, and assured voice to the faces of America’s multicultural minorities, especially the Latino population. She has spent a lifetime giving resonance to that voice. Now, semi-retired and living in North Carolina she has the time to share her insights and voice with those seeking meaning and mindfulness as they age. Laurina will be teaching a class in the winter session entitled “The Hero’s Journey.” The class not only teaches the philosophy of Joseph Campbell but how to realize our own journey(s) in the context of the Hero’s Journey model. The last time she taught the class was the fall of 2013 and made a lasting life altering impact on many. Laurina grew up on the southwest side of Chicago during the chaotic and turbulent 1960s, the daughter of multicultural parents. Her mother was a Mexican-American who grew up in Denton, Texas, in migrant labor camps speaking exclusively Spanish and her father was born and raised in Grenada--his family working a sugarcane plantation. A background of discrimination and underestimation gives her voice legitimacy and credibility. In spite of the challenges, she and her three siblings became successful in their own right: a psychologist, an attorney, and a published author. Laurina attributes the academic success in part to her parent’s uncompromising values, constant inspiration, and enduring support. 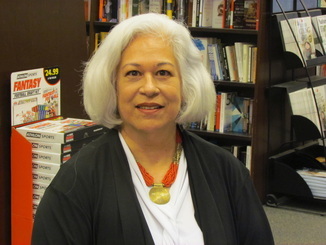 As an undergraduate, she studied Sociology at the University of Illinois and went on to earn her Masters in Social Services Administration at the University of Chicago. Her career has been vast, varied, and visionary. It includes teaching and training, consulting and collaborating, Laurina’s work experience ranges from work with the State Department to Women’s Centers to City and State social service programs: facilitating, teaching, directing, fundraising, designing, and implementing strategic plans as well as initiating and developing policy. Now she directs an organization where she conducts workshops, classes, and retreats on the art of mindfulness utilizing the paradigm and principles of the resilience-based model of Campbell’s The Hero’s Journey. Her insights into mindfulness can provide value to anyone’s personal world regardless of age. We are a changing demographic, the world is smaller, and our meaning complex. To understand our role in it may be the most significant lesson we can all learn.